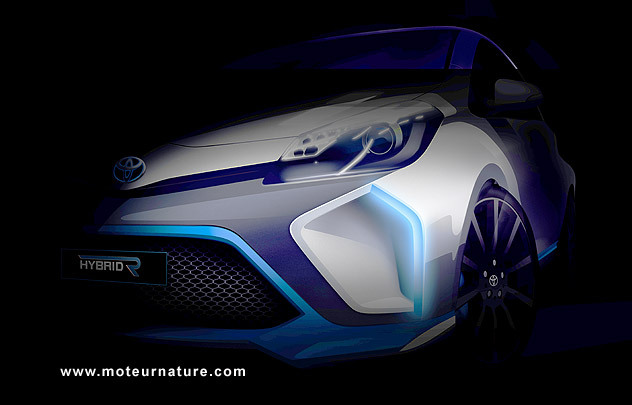 Toyota will unveil the concept of a fast hybrid car at next month Frankfurt motor show. It will feature a high power small gas engine with a hybrid system from the Le Mans TS030 race car. The one with supercaps instead of batteries. Total power is said to be 400 hp. This will make for a very fast green car, but a surprise is that this concept should be based on the Yaris. The Toyota Yaris, the little city car. In hybrid form, this the most fuel-efficient car available in Europe today, but nobody has ever thought of it as a fun car. This hybridR concept could change all that.